Some highlighted projects I’ve worked on during my carreer as a software engineer, as well as some fun side projects. 2014 - Globosat Play is a “TV Everywhere” VOD service that cable TV subscribers can use to watch content licensed by Globosat in Brazil - which includes movies, TV shows, documentaries and concerts - at no extra cost. I was the lead engineer responsible for creating and deploying the software platform that’s used to organize the VOD content of channels and TV shows. Apart from the usual technical stuff, that time I had the opportunity to work more closely with the product owners to help them develop a viable release plan for the first iterations. In order to be able to meet the agressive deadlines and scale the project across multiple teams, we decided early on to divide this big product into different smaller projects, each one with its own infrastructure, and assign a small team of developers (2-4 developers each) to take care of each project. By doing this, we wanted to eliminate the possibility of one small faulty deploy to cause a full blown service outage, and, at the same time, give each team a chance to develop a sense of ownership. The problem with this approach though is that those smaller pieces must look and feel like a single product, and the first step toward that goal was to find a way to share code among the teams, otherwise we would spend much time redoing the same things over and over again. We attacked this issue gradually over time by developing a few libraries of reusable components that went from small server-side helpers (i.e. date formatters) to a full-featured UX components toolkit a la Bootstrap. It wasn’t easy to convince the stakeholders this was the way to go, but the effort eventually paid off. 2013 - Combate is a brazilian TV channel that has the rights to exclusively broadcast all editions of the UFC - The world’s most popular MMA competition - in brazilian territory. 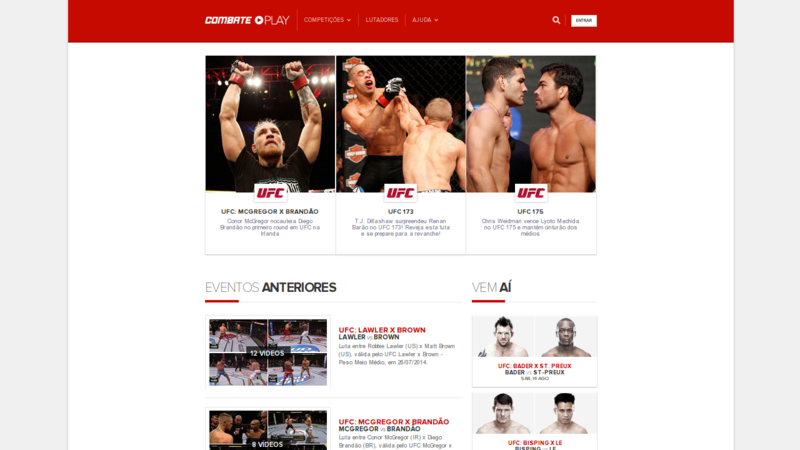 With Combate Play, the channel subscribers enjoy instant and unlimited access - at no extra cost - to a constantly updated collection of duels, and can also watch the UFC live over the internet via smartphone, tablet or computer. I was the lead software engineer responsible for the VOD aspect of the project, and worked in pretty much everything from server configuration, coding, testing, release planning, and so on. From a systems integration point of view, this was a very challenging project. The information was scattered through several APIs, some of them agonizingly slow, which in turn rendered the application nearly unusable in the first iterations. The performance problem was solved by combining a flexible caching system that supports both short and long-lived stale caching as fallback, agressive timeouts, and asynchronous client-side code to render non vital chunks of content. This gave us the ability to use different cache timeouts for different types of requests. The other benefit is that the system is now much more resilient against cascading failures. All my hacks are open source code. Check them out if you want to see what my code looks like. As a somewhat heavy Emacs user, I like the idea of not having to leave my favorite text editor when I need to do things like accessing the IRC, interacting with git, and things like that. One of the things I missed the most was the ability to control the Spotify client application from within Emacs, so I created spotify.el. With spotify.el, I can browse my playlists, list their tracks, show tracks from some given artist or album, as well as control the Spotify player (play, pause, go to the next track, toggle repeat, etc), all without leaving my text editor. It’s really nice to have everything just a few key strokes away; this is why I love Emacs so much. One thing I particularly liked was how smooth the whole process of creating this extension was. You can write code and have it evaluated right away right there, in the same editor, which makes it really easy to get things done. This page’s cover picture was generated using a simple function I wrote in Octave after reading a little bit about Fractals, which is a rather fascinating subject. Even though Octave doesn’t support threads, I’ve used the parallel package in order to compute the pixel intensity values in parallel by dividing the work into N jobs and submitting them to child processes spawned via fork(). Although the input and target images can be customized to produce any image, the goal of this hack was to paint Mona Lisa using a corpus of 3,588 images of Pablo Picasso’s paintings and drawings as pixels in the target image. The resulting file, a 13,960x20,800 JPEG image, can be downloaded from the project’s repository as a 7zip archive. In order to build that mosaic efficiently, I coded a minimal k-d tree implementation to help me with the task of finding the input image whose average RGB color is the closest of a given pixel in the target image. The code also had to be tweaked so it could run in parallel. Fortunately, this was easy to do thanks to Clojure’s built-in concurrency features like pmap and reducers. This is a Clojure implementation of Bencode, the encoding format used by BitTorrent for storing and transmitting loosely structured data between trackers and peers. The fun started by implementing the code that translates between bencode strings and Clojure’s native data structures. With this done, I started reading the metainfo file spec and thought it would be interesting to build a tool to create .torrent files, just because. BitTorrent metainfo files are expensive to compute due to the constant piece splitting and hashing, so in order come up with an efficient implementation, I replaced the poorly parallelized Clojure code with a pure Java implementation based on thread pools. The result was a fast implementation that can process very large files at roughly the same speed as mktorrent’s, which is implemented in pure C.
You can see all merged Pull Requests I’ve made over the years to other open source projects in GitHub. © 2018 Daniel Martins. Powered by Jekyll using my fork of the Balzac theme.